Recycled Canary Wood flooring from Staybull® creates modern and contemporary spaces that visually stunning. Each multihued wide-plank flooring you install creates a dynamic floor sure to complement your home’s décor. Each plank of Canary wood is carefully crafted to make the mixture of yellowish-brown to olive-brown with earth toned streaks pop. Combine the fact that the manufacturing process makes each piece stronger than typical Canary wood and you'll have a more durable and dependable green floor that will last, too. Contact us to get your free quote of eco-friendly Canarywood Staybull Flooring® today. 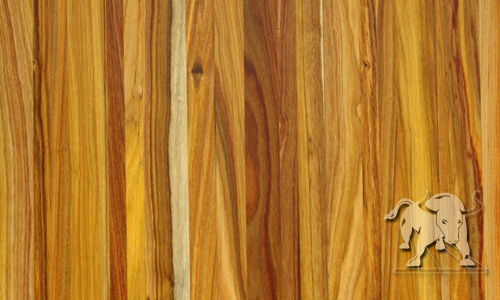 Heartwood varies from light-cream to a yellowish-brown to pale olive-brown streaked with olive green, dark gray, or pinkish-brown, and when mineral stained, streaks of steel blue. Grain is usually straight, regular, fine texture.